Here’s NBC’s reporting on all the plans for Bush’s funeral. Jonathan Allen writes that Bush was the last of his kind: a moderate Republican with an eye toward internationalism and free trade. 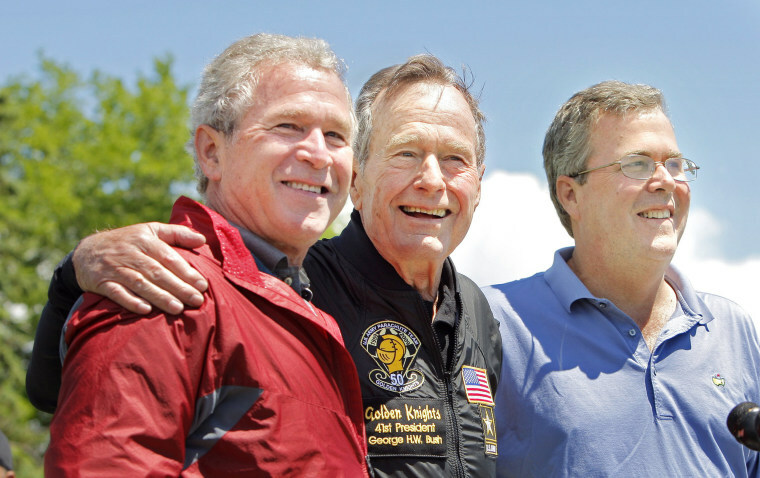 After his death, many observers are contrasting Bush’s demeanor with Trump’s. The Wall Street Journal notes how Bush’s complicated economic legacy helped shape the GOP. Lawmakers may push back the government funding deadline to allow time for the mourning of Bush’s death. A truce on trade will give both Chinese and U.S. leaders some “political breathing room,” writes the New York Times. Despite a drubbing in the House, Republicans aren’t spending much time looking inward post-midterms. The Supreme Court will consider a case that could affect the prosecution of Paul Manafort under state law if Trump pardons his federal convictions. Jim Comey has reached an agreement with GOP lawmakers about his testimony to Congress behind closed doors. Will Trump’s border wall get in the way of much-needed Arctic icebreakers? Trump says he’s likely to meet with Kim Jong Un early next year. The Washington Post writes that Trump’s skepticism of climate change is finding lots of sympathetic ears in his party. The GOP’s rhetoric on immigration may have consequences for the party’s standing with younger voters in the long run. Here’s the latest on that controversy over the NC-9 voter fraud allegations. Top Democrats are raising the alarm about Trump’s efforts towards a Trump Tower deal in Russia. Incoming House Judiciary head Rep. Jerry Nadler says that Michael Cohen’s admissions amount to proof that Russia had “leverage” over Trump. Democrats are fighting among themselves over the border wall funding debate. 2020: Is Obamaland catching Beto fevor? Campaigning for president this cycle is unprecedentedly early — and brazen — writes POLITICO. Some former aides from Obamaworld are catching Beto fever. Sherrod Brown says he doesn’t know if he’s the best person to take on Trump.